Unisex style fit for both baby girls and boys. High quality and heavy duty, best gift idea. Leather crosspatch on Y-Back, fashion and dressy. Great Y suspenders bow tie set for the price. The clips are very well designed and constructed. The band is elastic and durable. This set is easy to operate. Different color design will meet your taste. Kids suspenders and bow tie combo are very durable and can be hand washed or machine washed on a gentle cycle and lay flat to dry. The images we provided are very close to the actual product. Colors of the actual product may vary when viewing from different devices, such as computer screens (resolution issues), cellphones, tablets, or many others. Material - The kids suspenders and bow tie is made of Microfiber & Elastodiene, Leather, Stainless Steel. The material is durable, soft, stretchy and will back to its original shape after use. Y suspenders are elastic, they can protect the baby young shoulders don't hurt and reduce the pressure on child's shoulders. Wearing more comfortable. 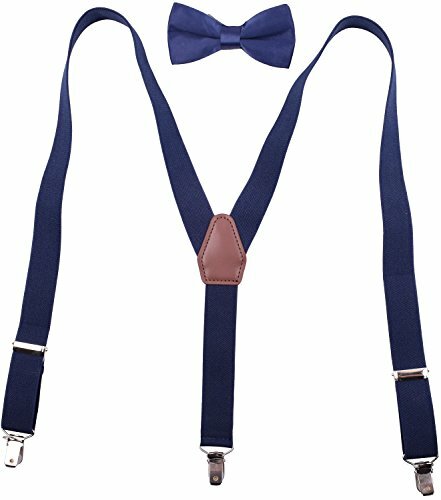 Bowtie and Suspenders size - The bow tie is pre tied and it has an adjustable strap which can fit up to different neck size. They can fit a variety of ages. Elastic braces extend to 30 inches. 22 inches for 7 months to 3 year old, 26 inches for 3 to 9 year old, 30 inches for 9 to 15 year old. Great 3 Strong Clips Design - 3 stainless steel clips. The clip clamping surface is clearly a superior design which holds up better over time, and clamps very positively on a wide variety of clothing materials. These clips will not easy corrosion, fading, slipping and breakage. They are easy on, easy off, easy to open and lock, and they stay put when on. The adjustable clasps are smooth. Functional - 10 colors to choose from,easy to match and suitable for tuxedo or suits, trousers, jeans, pants and shorts. In a simple and classic style, these suspenders can be a perfect accessory for all occasions, like wedding, birthdays, parties, work attire, school functions like band, choir and orchestra, etc. GUARANTEE: We stand by our products with excellent customer service and a 30-day warranty. If you have any questions, please feel free to contact us and we will reply you kindly and instantly. If you have any questions about this product by BODY STRENTH, contact us by completing and submitting the form below. If you are looking for a specif part number, please include it with your message.